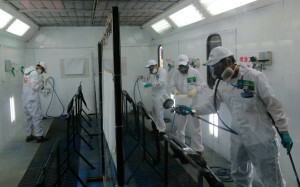 The Environmental Protection Agency announced Thursday it would tighten the air quality standards for ground level ozone to 70 parts per billion, down from 75 ppb, in a move which could prompt greater adoption of waterborne refinishing products in the collision repair industry. U.S. regions will have between 2020 and 2037 to hit the new standards, depending on their air quality. This could include restrictions on products with volatile organic compounds — such as solvent-based paints. “This will take years but actions like this will encourage states to find ways to comply and the collision repair industry is a candidate,” Tim Jones, PPG automotive collision segment manager for waterborne coatings and refinish, wrote in an email Thursday. Earlier restrictions had already caused states — perhaps most notably, California — to crack down on the sale or use of products containing certain levels of VOCs. Essentially, this meant that collision repairers had to switch from solvent-based basecoats to waterborne ones. This and other steps to reduce ozone between 1980 and 2014 have cut ozone by 33 percent on average nationally “while the economy has continued to grow,” the EPA wrote. The agency expects “the vast majority” of American counties who haven’t yet reached compliance to achieve it by 2025. States can hit the target — or adopt a stricter one — in a variety of ways besides targeting refinishing products. Still, technicians and shop owners who don’t use waterborne paint now will want to keep an eye on their state’s plans just in case. A switch requiring new training and equipment could be in the works. Ozone in the stratosphere is healthy, protecting us all from getting too much ultraviolet radiation; in fact, other Clean Air Act rules preserve it up there. But on the ground, produced there when nitrogen oxides react with VOCs, it can affect human respiratory systems, according to the EPA. Those wanting to learn more about automotive refinishing should check out “Paint Shop Performance” with John Fagan of PPG at this year’s SEMA Show. The presentation will be part of the Society of Collision Repair Specialists’ Repairer Driven Education series. Register here. Complying with the new rule will cost $1.4 billion a year, but Americans will make it back in at least $2.9 billion — possibly as much as $5.9 billion — worth of annual health benefits in 2025, the EPA estimated.